In the autumn of their Year 6 (September) children who hope to attend the local Grammar schools sit their 11+ papers, in school. They take place on two consecutive Fridays, firstly a verbal reasoning paper ( word problems, some maths, some written logic questions etc.) and secondly a non verbal paper (diagrams and shapes). Both papers are multiple choice. Families often have a lot of questions about the 11+ so we hope these FAQs, compiled over time to respond to many worries, will be useful. Do I have to return the paperwork school has sent me if my child is not going to sit the test? We would appreciate all our families returning the documents, if you have decided that your child is not going to sit the test please state this on the paperwork so we know this is your intention. In this way we know we have a record of everyone’s plans and no paperwork has gone astray. Can we change our mind and opt out of sitting the test having returned the paper work? If you decide not to sit the test after having returned the documents this is not a problem; let us know and we will tell the test facilitator. It is easier to say “yes” initially then opt out rather than say “no” then opt in. If you are uncertain we would suggest you say “yes” then reflect and decline, should you wish to, at a later date. Is the 11+ taught in school? The content of the 11+ is not taught in school, it is a style of testing unlike the SATS or equivalent Y5-6 school assessment, it is not representative of the National Curriculum and it is not appropriate for all children. While the grammar schools do not advocate “hot housing”, or excessive tutoring, facing the tests without some prior practice or experience would be daunting for the children and they would be unlikely to succeed. We do however administer practice tests, just as the real ones will be delivered, which are sent to us by the grammar schools in June/July. Whilst we are not allowed to let these papers leave the school premises parents are welcome to come to school and look at them to see where their children may need further practice over the summer. How much practice will my child need to do before taking the test? As a parent who has had their children work their way through the 11+ I would recommend pupils who plan to take the papers in September practise these skills so they become familiar. To avoid “cramming” over the summer holidays, and to ensure they are accustomed to the style of questions and the techniques required to answer them, we would suggest children begin this process during the spring or at the latest, summer term. Timing, and completing enough of the questions to secure a high enough percentage score, is critical to success. Will my child need a tutor? There are a range of resources on line, to buy from Amazon or for sale in WH Smiths, which can help children practice for the 11+ at home. Parental guidance is recommended to ensure the practice is representative of test conditions and to talk through the techniques so the child doesn’t feel overwhelmed. Some families chose to use a tutor but this is a matter of personal choice. 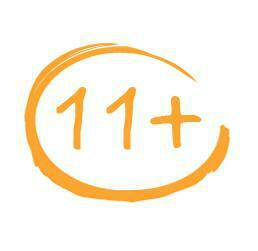 What score is needed to pass the 11+? The final score has, historically, been out of 280 - how this is arrived at is a bit of a mystery! However it is a combination of both verbal and nonverbal raw scores plus additional points which are awarded depending on when your child’s birthday falls, the older pupils in September gain virtually nothing but summer babies have extra marks awarded, with a sliding scale in between. As a guide, when practising, I was told to expect to have to score of at least over 80% to have enough marks to pass. A pass is usually a score of around 220-225 but can change by the year depending on how the children perform. What happens if my child does not score enough marks to pass? The test results are sent to all families in October which give the child’s score and states if this is sufficient to be a pass. Recently this has been by post arriving on a Saturday. School are emailed too, usually on the following Monday. Whilst the results are confidential the children inevitably talk about them at school and it does become apparent who has been “successful” and who has not. This can be difficult for some children and we do our best to minimise any conversations and discussions about the subject, we do not celebrate the results in public. The 11+ is a pretty accurate sifting mechanism and children who do not score enough would probably not manage the pace and rigour of the grammar school curriculum. The children who tend to pass usually represent the top 25-30% of a cohort and typically have a strong academic history in school. Not passing is nothing to be ashamed of and, across the county, 7/10 children will be in this situation. We are fortunate to have excellent academies in this area so all our Y7’s will go to a good school. What happens if my child passes but decides they do not want to go to grammar school? The 11+ results are given before children have to finally decide on their choice of secondary school. It is then up to the pupil to choose where they want to go. There is no obligation to attend a grammar school just because they have passed the test. The 11+ is applicable to all grammar schools, Sleaford merely administer it. The actual test is sat at school on two consecutive Friday mornings in September. We will keep all families in the loop about all the secondary schools in our area (open days, evening s evets etc.). Can I talk to my child’s class teacher, to seek their opinion about my child and the 11+? There is a parents evening in March, your child’s teacher will be able to answer any questions then. I hope that the above covers all the questions you may have about the 11+, but there may be others we have not thought of. So if you have a specific query in the meantime, that these FAQ’s don’t cover, please ask Mrs Coyle or send them to her via Mrs Short. http://www.gl-assessment.co.uk/11-all-you-need-know this is the company who produced the practise papers the children sit. Practise tests are provided to take place in school during July and we will advise parents of: when these will be administered, the outcome and what areas of revision may help thereafter. Please feel free to ask any further questions, the office will suggest will the best person to advise you.